Nearly six-in-ten Americans (58%) say they’re “especially looking forward” to the Winter Olympics next month, including roughly equal shares of each age group. But when it comes to this year’s other quadrennial international sports event – the World Cup – it’s largely young people who are anticipating it. 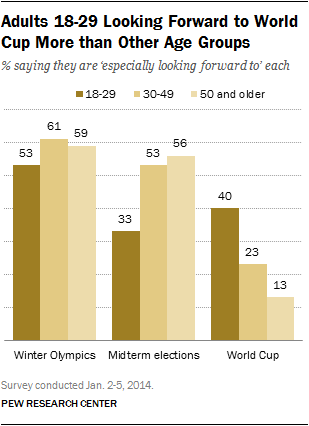 It’s not that young people aren’t looking forward to the Winter Olympics, too: 53% are looking forward to the Sochi Games, which is roughly the same share as other ages. But they stand out for their anticipation of this year’s World Cup in Brazil in June and July, with the U.S. poised to face an exceptionally tough opening group of opponents. Four-in-ten adults ages 18-29 (40%) are looking forward to the World Cup, compared with just 13% of adults 50 and older. Roughly the same share of the public is looking forward to the World Cup this year (22%) as it was in 2010 (23%), when young people were also the most likely to express anticipation. This World Cup age gap can be explained in part by the views of U.S. Hispanics, who are much younger than the general population. (The median age of Hispanics is 27, while the median for non-Hispanic whites is 42.) Roughly half of Hispanics (46%) are looking forward to the World Cup, compared with 15% of non-Hispanic whites. Younger adults’ interest in soccer likely relates to higher participation rates than their parents’ generation. 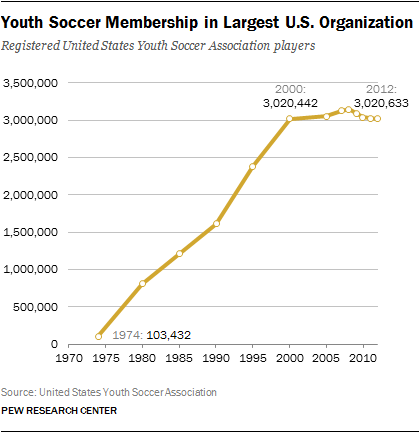 Participation in US Youth Soccer, the largest such national organization, jumped from about 100,000 in 1974 to 800,000 in 1980 to 3.02 million in 2000. But participation has mostly stalled since then, and membership remains at 3.02 million (while the American Youth Soccer Organization counts over 500,000 members). 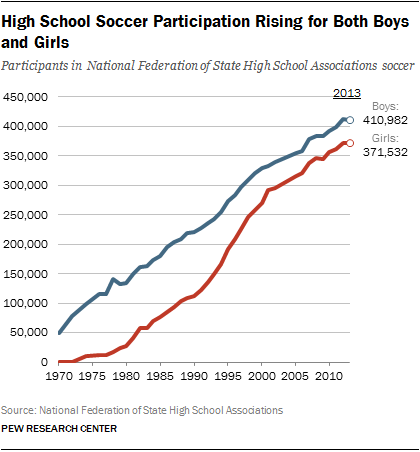 Participation at a high school level has soared in recent years, as well. More than 370,000 girls and 410,000 boys play on sports teams governed by the National Federation of State High School Associations. It is now the fourth-most popular sport for high school girls and fifth-most popular one for boys. This year’s TV ratings will shed light on whether anticipation turns into action. More than 111 million Americans watched at least six minutes of the 2010 World Cup, a 22% increase since 2006, according to Nielsen. By comparison, 190 million Americans watched at least some coverage of the 2010 Vancouver Games, according to NBC.